Born in Chicago, Karl Benjamin began his undergraduate studies at Northwestern University in Evanston, Illinois in 1943. Interrupted by service in the US Navy during WWII, Benjamin resumed his studies at Southern California’s University of Redlands in 1946. Graduating in 1949 with a BA degree in English literature, history and philosophy, Benjamin began his career as a teacher with no intention of becoming an artist. However, his relocation to Claremont California in 1952, shortly after he had begun “playing” with paint in 1951, galvanized his sense of his career path. Though he continued to teach in public schools and, later to great acclaim, for Pomona College, the artist’s work blossomed amid the extraordinarily lively art, design and architecture scene in Los Angeles in the mid twentieth Century. 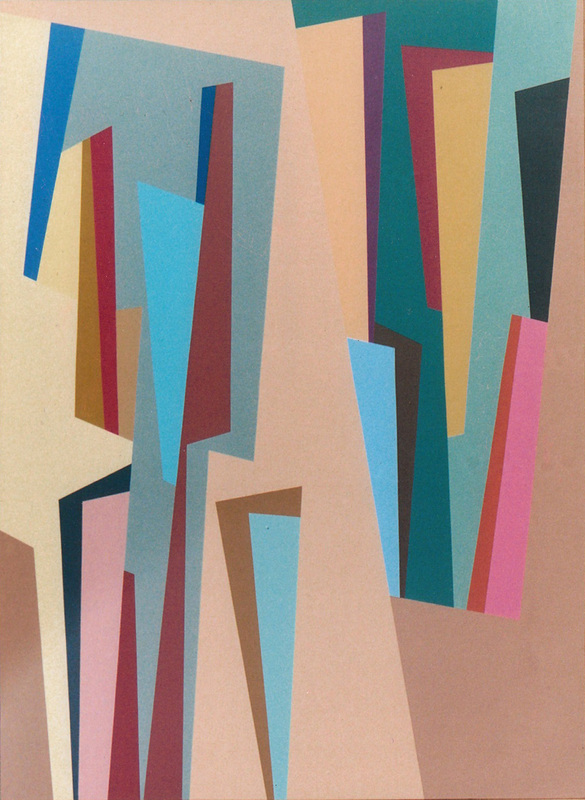 Numerous gallery showings of his work during the 50’s culminated in 1959 with his inclusion in Los Angeles County Museum of Art’s ground-breaking exhibition Four Abstract Classicists: Karl Benjamin, Lorser Feitelson, Frederick Hammersley and John McLaughlin. The exhibition garnered national attention for the artist along with the creation of a moniker for Benjamin’s meticulously orchestrated color and form, Hard Edge Painting. Subsequently Benjamin’s work was included in the exhibit Purist Painting traveling to Walker Art Center in Minneapolis, the Everson Museum of Art in Syracuse and the Columbus Museum of Art. The Whitney Museum used his work in Geometric Abstraction in America. Museum of Modern Art (NY) also featured the artist in their watershed exhibit The Responsive Eye. Benjamin was awarded the National Endowment for the Arts Grant for Visual Arts in both 1983 and 1989. His work has been featured in numerous museum exhibition and is included in the public collections of the Los Angeles County Museum of Art; Museum of Contemporary Art, Los Angeles; Museum of Modern Art, Israel; Oakland Museum, Oakland, CA; San Francisco Museum of Modern Art, CA; Seattle Art Museum, WA; and the Whitney Museum of American Art, NY among others. Benjamin is currently a Professor Emeritus at Pomona College and lives in Claremont CA.